Last month, we celebrated International Women’s Day and highlighted the women who support and strengthen the work of SOS Children’s Villages around the world. What motivates or inspires you to be involved in the work of SOS Children’s Villages Canada? Rumina Ratansi: Children are the future of the world. Why not invest in their development and care so that they are able to create and design the best future (for us, for them and for future generations). I was born in a 3rd world country so I definitely have a desire to see change. If I'm able to be part of that change then I know I've started a blue print for designing the future! Jennie Moushos: I was inspired by SOS Canada as it was an organization that related to my values and beliefs. As an immigrant myself, I understand the struggles and obstacles faced by children around the world. I was one of the lucky ones as my path could have been very different if it wasn’t for my family, a good support network and access to an education. Not everyone has the basic needs of life available to them and I wanted to make a difference even if it was in one child’s life. Another reason for choosing SOS Canada is how inclusive it is. Children of all religious beliefs and all nationalities benefit. Mary Ballantyne: I have spent my career, over 35 years, working with vulnerable children and families within the Canadian context. I joined the board of SOS Children's Villages Canada because I believe there is much to be learned domestically by observing what is happening with vulnerable children and families globally and vice versa. Canada has a well-developed child welfare and child protection system, yet many serious issues continue to exist. The experience with SOS Children's Villages provides an opportunity for us to share our learnings from Canada with others in a global context. It also provides the opportunity for Canada to learn about what is working in other countries around the world. Alicia Quesnel: Real and sustainable change is generational. This is true locally, nationally and globally. If we want to see change, we need to focus on ensuring that the next generation is given the opportunity–through health, well-being and education–to grow up and make a positive and lasting difference in their local communities. That is what first drew me to SOS Children's Villages as a global organization, and when I had an opportunity to help out with SOS Children's Villages Canada, I was very excited.Jennie Moushos: This one is a hard one as we have had so many successes over the years. SOS Canada is one of the few charities that does not depend primarily on government funding for projects. It focuses on fundraising efforts, which are not always easy, so it is imperative you have the best people in place. The team running SOS Canada is energetic, dedicated and go above and beyond to make a difference. Without them we would not have been able to have amazing partners like Air Transat, Mike Holmes of the Holmes Group, Intact and Cirque du Soleil. 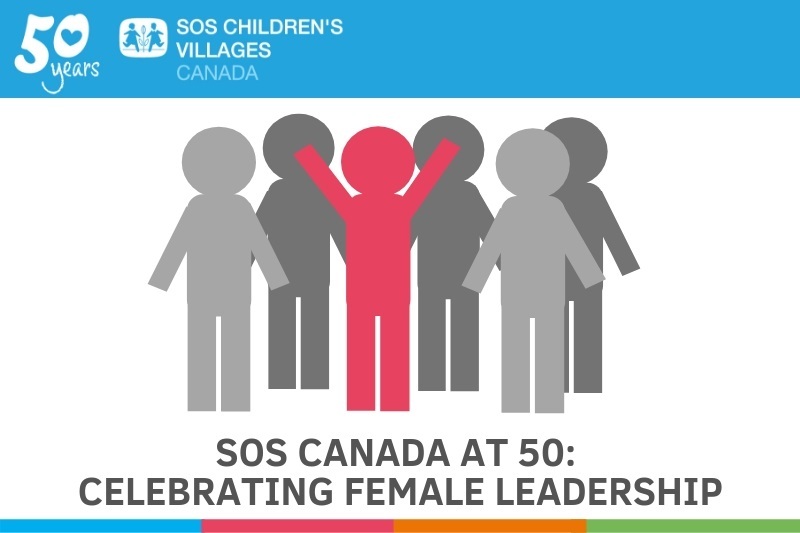 As SOS Children’s Villages Canada celebrates its 50th anniversary, what would you say are some of the organization’s greatest accomplishments? Jennie Moushos: This one is a hard one as we have had so many successes over the years. SOS Canada is one of the few charities that does not depend primarily on government funding for projects. It focuses on fundraising efforts, which are not always easy, so it is imperative you have the best people in place. The team running SOS Canada is energetic, dedicated and go above and beyond to make a difference. Without them we would not have been able to have amazing partners like Air Transat, Mike Holmes of the Holmes Group, Intact and Cirque du Soleil. Mary Ballantyne: SOS Children's Villages Canada has been able to provide significant funding to various SOS programs in developing countries around the world. It has also been able to provide insight into the development of more community and family-based programming. Alicia Quesnel: Before I started working with SOS Children's Villages Canada, I didn't fully appreciate the scope of work an international organization does. SOS Children's Villages not only provides a home for orphaned and abandoned children, but it sees to their education, to their communities and seeks to strengthen their extended families. In addition to its child sponsorship opportunities, SOS Children's Villages Canada has made financial commitments to support a number of specific overseas programs, such as the Ondangwa Village, the Ugandan Girl's Education Project and the Keranyo Day Care Centre. These commitments allow SOS Children's Villages Canada, and those who donate and support us, to make connections with specific communities. I also appreciate having the ability to donate to an organization I trust when a crisis or disaster occurs. I know my donations will make a difference! Rumina Ratansi: Always reaching for the stars, doing more than the achievable, shaping the lives of children who deserve the world at their fingertips, putting a smile on everyone's face! In five words or less, what does SOS Children’s Villages Canada mean to you? Jennie Moushos: The opportunity to change the course of one young child’s life. As a female leader on the SOS Canada board, what advice would you give to the next generation of women looking to get involved in our work? Rumina Ratansi: This is where hard work pays off. This is where dreams become reality. This is where we can be united with other women around the world to build a brighter future and a more economically stable one. Being part of the board is immensely rewarding and it is a humbling opportunity. Mary Ballantyne: Women play an integral role in the care of children. Providing children with strong female caregivers (mothers) is one of the significant features of the SOS Children's Villages model. Having more women take leadership roles in this organization provides women here with an understanding of the importance of providing opportunities for women’s empowerment internationally. Jennie Moushos: Start volunteering early! I know how busy life can be and in today’s environment that will not go away. Find a few hours to volunteer; it will not only help the children, but you will surprise yourself with a happier, healthier you.